Kate tried not to rattle the strainer on the cup, but did, and spilled a couple drops off the spout of the teapot, again. She found her bodice a bit constricting, which wasn’t helping matters. “You’re trying too hard,” Jane said, judging Kate’s efforts out of the corners of her eyes. 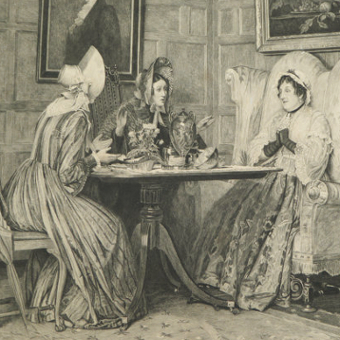 The ladies were seated at a little round table with a silver service and fine china. A maid had laid everything out, now Kate tried to act as hostess. Her step-mother coached, correcting errors, while also being prim and proper. She was joined by her sister, Lady Gordon, clothed in an exquisite visiting suit, having arrived by carriage. Kate wore a silk house gown, a particularly lovely weave which shimmered green to teal to blue, with flying wyverns depicted on the large buttons of the bodice. The fourth member of the party, Kate’s governess, Miss Nestor, sat very quietly awaiting instructions. “What a lovely vase.” Jane rose and turned to the sideboard. “Well done,” Lady Gordon said quietly. “It was one of a pair,” Kate continued, “but the other was lost long ago.” I broke it, actually. “Yes, better,” Jane agreed, taking her seat. Kate passed the latest cup and saucer across to Miss Nestor, who in stark contrast to the ladies wore her usual plain black pinafore and white muslin shirt. She had three cups of tea, and two plates of tarts and biscuits. Kate took yet another little silver spoon and scooped tea into the cup, wishing she didn’t have to wear lace gloves for this exercise. Goodness gracious! Is every little thing that important? Really? She tried again, keeping a slight smile playing upon her lips, her eyes half closed, a supposed sophisticated visage taught to her by Jane. “What an interesting painting,” Jane said, peering over the fireplace. “Well done again,” Lady Gordon whispered. Kate let her lips part and really smiled for a moment, then slipped back into her false face. Scandal At Tea, by W.D. Sadler, created in 1893, it hearkens back perhaps to the 1840s. “Indeed.” Lady Gordon gave a firm nod. Kate glanced back and fourth at the sisters while pouring the next cup. “And with child?” Jane gasped. What?! Whose brother? A highwayman! Kate’s curiosity turned to excitement. “Do go on,” Jane prompted. “He’s riding from Prague,” Lady Gordon announced. “For a duel!” Kate burst. “Swords or pistols?” And she poured tea all over the table. “Look what you’re doing!” Jane jumped to her feet. I’ve made a mess for the washers. I must be more careful. Kate examined her skirt for splatter. A pretty little maid hurried in and started clearing the tea service onto a sideboard. Mrs. Farewell followed with a clean cloth. “You’ll want a fresh pot, I’ll wager?” she asked. “There’ll be no more sugar. We’ll waste a quarter loaf at this rate.” She pursed her lips and eyed Jane sternly. Mrs. Farewell took a moment to glare around the room, then left. Since the woman had taken on duties as housekeeper of the Beaufort’s London house, Kate had seen her only in the spring. At least staying in the city provided some opportunities to be with her old nanny. “Yes, Lady Beaufort,” Kate said in a sigh. “Kate! Such enormous great gasps will never do,” Jane said emphatically. “Except in bed,” Lady Gordon exclaimed, and laughed shrilly, Jane joining in. Kate felt herself flush. Is that considered polite conversation? “Ladies, please,” Miss Nestor said. “Indeed,” Miss Nestor said drily. “When you’re done this instruction, my lady, you will find me in your study.” She performed a brief curtsey and disappeared into the corridor. 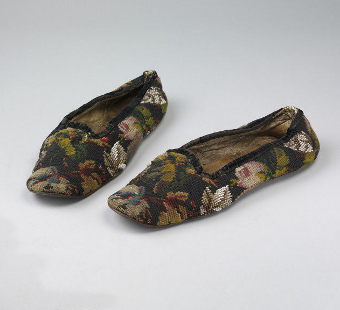 Soft wool, leather, and velvet trimmed slippers, 1830 – 50, Victoria &Albert Museum. Once in the solar the ladies sat for a few moments, reviewing who could approach whom when passing in the street. Kate should not acknowledge any man she did not know well, never even look at one who outranked her, ideally always letting them come to her and tip or remove their hats before speaking, but of course it became more complicated if she was walking with an acquaintance and they knew a man who approached, or a well known man met her with unknown friends. 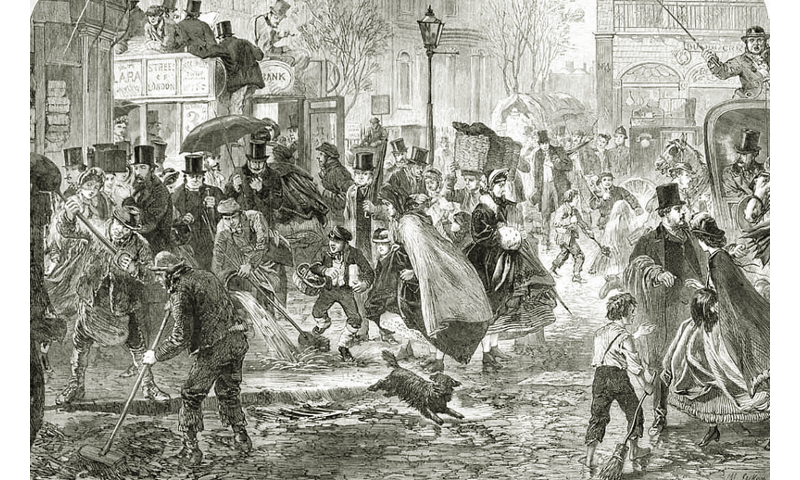 A Thaw In The Streets Of London, London Illustrated News, February 1865. Kate’s concerns about navigating the streets of London are nicely illustrated. Lady Gordon (at least with her heeled boots) stood a few inches shorter than Kate and possessed a stern face, unlike the rest of the Primrose family who were rather short and jolly. “Look at yourself.” Lady Gordon ordered. Kate dutifully studied her reflection. She adjusted her mouth and eyelids to the expression of disinterest taught to her by Jane. “I look so disdainful,” Kate whispered. “You’re exaggerating,” Kate grumbled, growing tired of Jane constantly making such statements. She scowled at her reflection. “Look at that!” Lady Gordon exclaimed. “What?” Kate perceived only her irate expression. “True,” Lady Gordon chimed in. Kate disagreed, thinking of her father, brother, churchmen, and others, but didn’t interrupt. “You do?” Kate said, blinking in surprise at this announcement, and at Jane’s fury. “I think you’ve said enough,” Lady Gordon murmured. Kate felt her face growing hot. She inwardly cringed as Jane candidly continued. The mantle clock began to chime. “Time I was on my way,” Lady Gordon said, stepping to the doorway. “Let me show you to the front hall.” Kate strode into the corridor and down the stairs. At the bottom of the stairs, Ebony waited, tail wagging. Kate removed her gloves and crouched to fondle her soft ears. Having Ebony with her in London was a small boon granted this year because of the death of Cinders. Ebony wasn’t allowed upstairs, yet, but Kate was already sneaking the retriever up to her bedroom late at night. Lady Gordon manoeuvred around Kate, but Jane halted on the stairs. “You don’t pay attention to a dog when you have guests!” Jane bellowed. Kate sprang up to attention. Ebony jumped too, and yowled playfully. “Let’s find your coat, Lady Gordon.” Kate beckoned and hastened into the front hall, slipping her gloves on. Reynold, the tall brawny footman, in snug fitting silk livery, stood by the front door, and upon seeing the ladies stepped into the cloakroom, emerging a moment later cradling a cape festooned with tassels and soutache trim. He remained upon the step, half hidden by a marble pillar. Reynold’s low brow, square chin, comportment, and impeccable manners always turned female heads. At least twice Kate’s age, she often felt a tremble upon seeing him, and looked for excuses to have him accompany her on excursions when appropriate. Taking her dog for a walk, and having her maid and a footman as attendants, moved up in priority on Kate’s daily task list. I must change into a walking suit. “Thank you for visiting us today, Lady Gordon,” Kate said. “My pleasure,” Lady Gordon replied. She gave Kate a little hug and whispered, “You’re doing very well, my dear.” She took a step back and nodded to Reynold. Reynold helped Lady Gordon with her cape as the sisters exchanged farewells, then he opened the door and held it aside. Lady Gordon descended the stairs to her waiting carriage. “Of course, my lady.” Reynold bowed, without any emotion, his face blank. “Can’t a hallboy simply take Bonny for a run up and down the street?” Jane asked. “There’s a packet of mail for you, my lady,” Reynold said softly to Kate. God’s wounds! Kate had gone from happy, to annoyed, to embarrassed, to enraged, in mere seconds. Her heart pounded and her body burned. She rotated away from Reynold, hiding her face as much as possible, only to spot her flushed image reflected in a large mirror. Grr! Damn and drat! The words were delivered as a command, not a request. Jane’s smile vanished and she raised her eyebrows while peering up at Kate, who towered menacingly close with a hand held ready. Ebony edged between them and let out a small whine. “Who?” Jane followed close behind. Earl Hugh Grosvenor, pencil and chalk circa 1855, Baron (Charlie Canning) Garvagh, photo 1862-66, Countess Ada Lovelace, watercolour 1835. In March 1848, Grosvenor was aged 23 years, Garvagh 22, and Lovelace 32. “She probably wants you to visit her daughter,” Jane ventured. I just stumbled upon your very intriguing Website. Subject matter aside (that is not the topic of this comment), it is extremely well designed, laid out, and informative. I wish other Webpage designers (“Information Architects”) were half a saavy as you. This Kate Tattersall sounds like a very interesting character, combined with intrigue. However, it’s a bit past my period of interest, and a whole continent away. My interest is in the Alamo and the Texas Revolution of 1836, which is the “Regency” period, at least fashion-wise. However, I will be travelling to the UK in June for an Alamo reenactment to be held at Weston Park, near Telford, Shropshire, England on June 24 & 25. I portray Capt John Hubbard Forsyth, a Cavalry officer (dismounted at the Alamo), whose heritage was Scottish, as is mine. We have about 1000 reenactors signed up who will contribute to making this the LARGEST Alamo reenactment in history, surpassing the magnitude of any Alamo events that have been done in Texas (unless you count movies as reenactments)! Thanks Jerry. I’m glad you like this site. Have a good time visiting Shropshire. I’m surprised that the biggest Alamo reenactments aren’t held in Texas.